Pulseaudio Crossover Rack offers you a graphical user interface to build arbitrarily complex multi-way speaker crossovers for stereo systems. The two-channel limitation (stereo) is hardcoded at the moment. If you have a use case for multi-channel crossovers please contact me and we will see how to proceed. 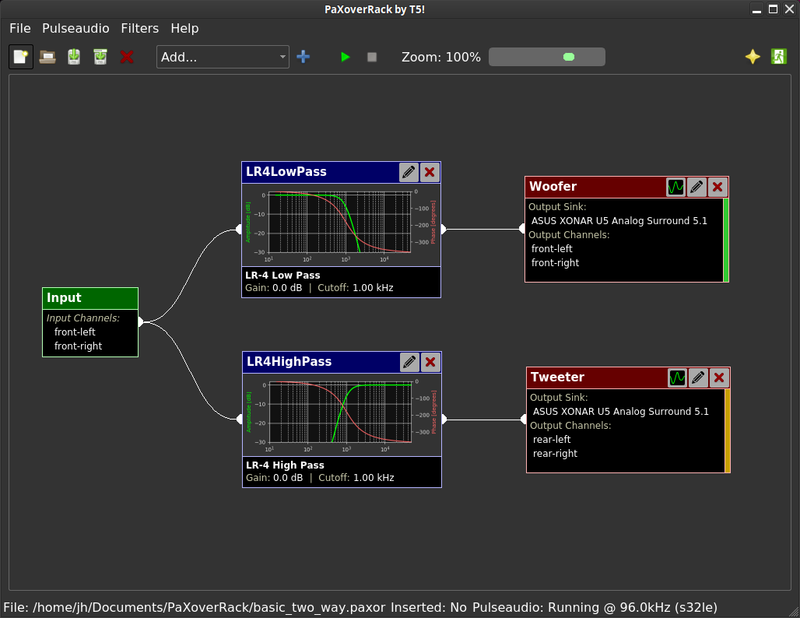 The input sink is always named "PaXoverRack.Input" and will be set as default sink after inserting the filter chain. 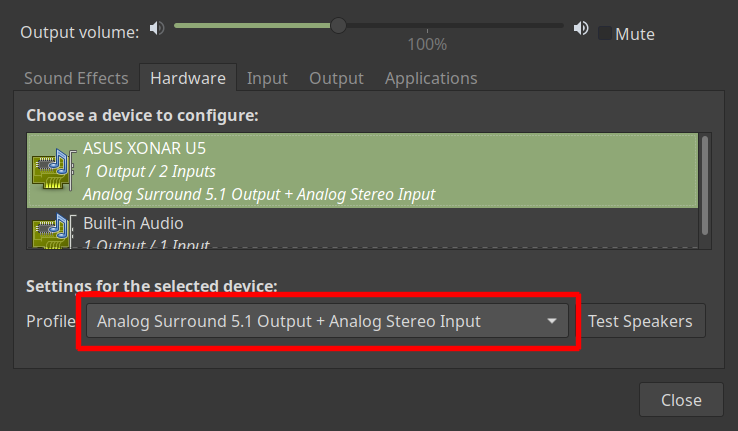 This allows any pulseaudio-enabled application to play sound through Pulseaudio Crossover Rack by system-wide default. This program makes use of the Pulseaudio audio server backend which is used by many of today's linux and unix desktop environments. It also uses a set of LADSPA plugins, namely ladspa-t5-plugins for the heavy lifting of DSP/autio processing. 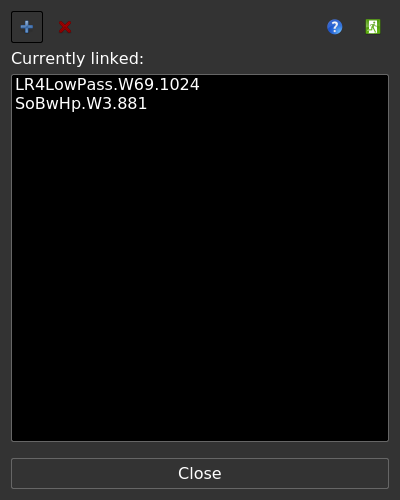 The LADSPA plugins are inserted into the pulseaudio system by load-module ... statements. The complete chain is persisted into your $HOME/.config/pulse/default.pa file and all the filters are loaded automatically on each start of the pulseaudio system, which most of the time is started in the background when you start your favourite desktop environment. All filter and splitter sinks names are prefixed by "PaXoverRack." For Pulseaudio Crossover Rack to work you need a multi channel soundcard with a stereo pair of outputs for each speaker pair you want to drive, so for a 3-way stereo setup you need a six channel soundcard. It doesn't matter if the channels are named after the surround theme, for example you could use the center/LFE channel to drive your tweeters. Delay freely adjustable from 0 to 1000ms. Actual delay is rounded to the nearest whole sample and thus depends on the sampling rate of the pulseaudio server. Completely linear frequency and phase response. Combines a sample accurate delay with a fractional delay filter to achieve sub-sample accuracy. Depending on the fractional delay the frequency response has a low-pass characteristic. If the fractional delay is 0, phase and frequency response are linear, if the fractional delay is 0.5 samples the frequency response drops to 0 at nyquist frequency (1/2 sampling rate). This filter should not be used on tweeters when sampling rate is less than 96 kHz! 192kHz SR is probably most desireable in this case. Creates a new, empty crossover file with just an input. Opens an existing crossover file (file extension: .paxor). Saves the currently opened file. Saves the currently opened file with a different name. Closes the currently opened file. Dropdown selection to choose a filter our output to be inserted. Press this button to actually insert the chosen filter/output. Insert the filters in the currently loaded file into the pulseaudio system. Remove all crossover filters from the pulseaudio system regardless of the file currently loaded. Use this slider to change the zoom level of the filters/outputs. Show the information dialog about Pulseaudio Crossover Rack. This function will remove your $HOME/.config/pulse/default.pa file so pulseaudio will use the system defaults in /etc/pulse/default.pa again after a restart of the pulseaudio server. Use this function in case pulseaudio will not start up because of some garbage in the file. Forcibly restarts the pulseaudio server by calling it's shutdown functionality and killing it with signal KILL after three seconds. After the pulseaudio server is stopped it will be restarted again. Only use as a last resort, this should normally not be necessary! The input widget is always contained in a .paxor file an represents the input sink of the filter chain. From it's output connection ponit you can draw connections to other filters or outputs. The filter widget shows the chosen filter/sink-name in the top left corner. On the top right corner are buttons for editing a filter and for deleting a filter. The area below the caption shows the frequency and phase response of the filter. The bottom area shows infos about the current state of the filter. The output widget shows the chosen output/sink-name in the top left corner. The first button shows the overall frequency response of the filter chain from input to output. The second button opens the dialog to choose the output sink (soundcard) and the channels of the output sink. The third button deletes the output. The area below the caption shows the currently chosen output sink and output channels. Connections between input/filters/outputs are draw as white bezier curves. A input/filter/output with an established connection has its connection points drawn in full white instead of an empty white semicircle in case of no incoming or outgoing connections. New connections can be made by using the mouse to drag from one connection point to another connection point. Established connections can be deleted by right clicking a connection point (doesn't matter if on the input or output side) and choosing "Disconnect..."
The GUI shows a green "Play" button and a red "Stop" button. The "Play" button will insert the filter modules into the pulseaudio system, the "Stop" button will remove them. 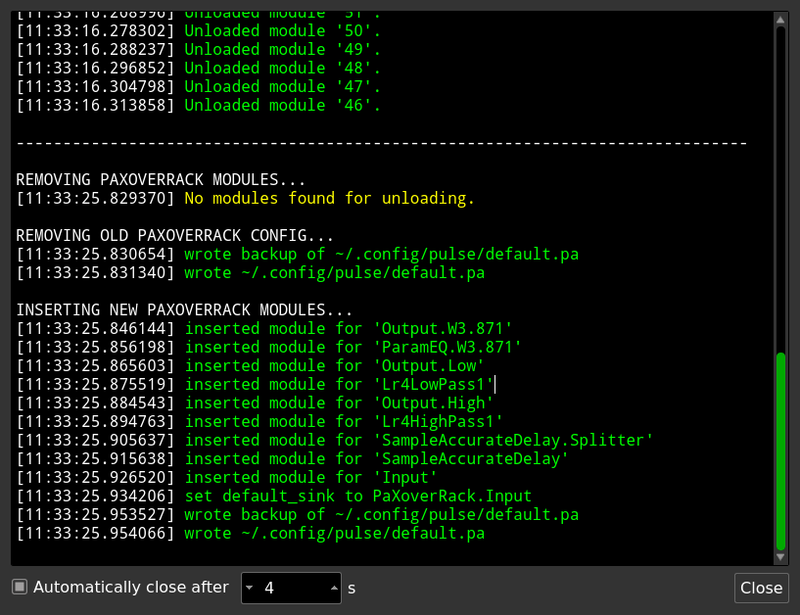 When inserting modules all modules already inserted by Pulseaudio Crossover Rack will be removed first. On startup or when loading a file from disk the program will check, if there is a config snippet in $HOME/.config/pulse/default.conf with a UUID which matches the currently loaded file. If the UUIDs in the file and the config snippets match, the program will assume that modules are already loaded and will try to enable real time parametrization of the filter modules. Before removing the modules a dialog window will pop up where you can choose the new default sink (as shown above). After a successful removal or insertion of modules all running streams are reconnected to the new default sink. Of course in case of module insertion the input of the crossover filter chain is set as new default sink. Loading and unloading actions and results will be shown in the Console Dialog. When you try to unload or insert modules all actions and their results are shown in the console dialog window. If you check the checkbox next to "Automatically close after..." you can adjust the number of seconds after which the dialog window will close itself automatically. If you click the edit button on a filter (the on with the little pencil icon) you will be presented with a dialog like shown above with sliders and textedit boxes for all the filter's parameters (depends on the type of filter). For exact value entry use the textedit field, for quick and coarse adjustments use the sliders. Filter parameters are updated immediately and if the crossover file is already active in pulseaudio all parameters are updated in real time, so you can hear the results immediately. 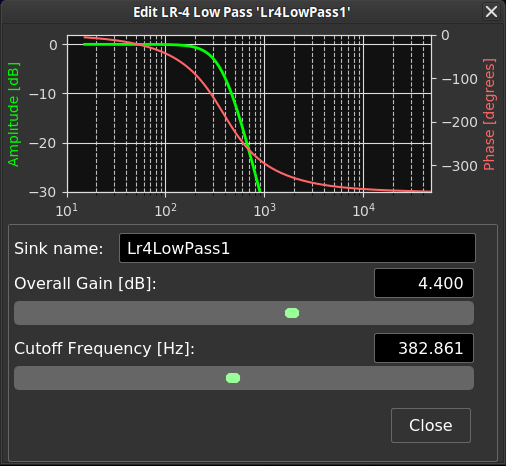 This dialog allows you to link two frequency parameters of high- and lowpass filters. As a result, if you change the frequency of one filter the other one is apdated, too. This is abviously useful if you want to change the crossover frequency between for example the woofer and the midrange and check which cutoff frequency suits you best. Aou can add a new link by clicking the blue + icon. An existing link can be removed by clicking the red x icon. In the "Filters" menu you can show a FRD dialog for any of the filters in your crossover file. This dialog lets you load a FRD file from disk which contains a frequency/phase response measurement for a single speaker driver. You can choose if you want to see the speaker response summed with only the local filter response of the chosen filter or the cascaded filter response of the chosen filter and all filters inserted before it in the filter chain up to the input. You can also show a "Global FRD dialog" which can show the summed up response curves for all open FRD dialog windows. When using this dialog it is recommended to open a FRD dialog for each filter directly before an output.